Hi! What a week! 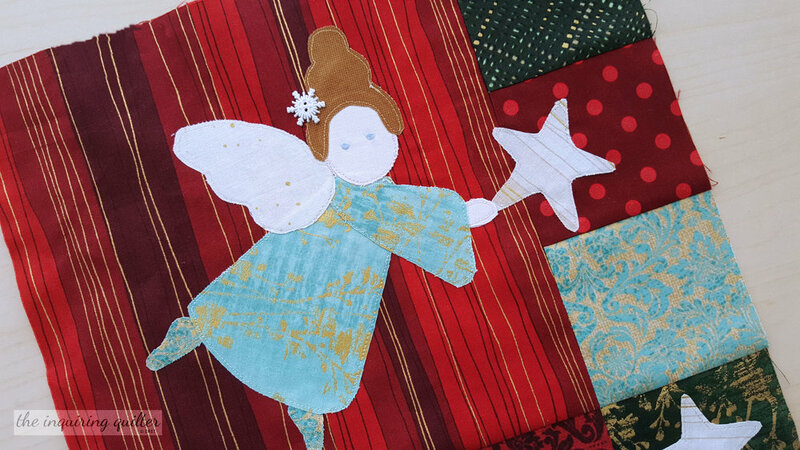 First, I made Block 6 for the I Wish You a Merry Quilt Along--the Hanging Stars Angel block. It's not too late to join us! To learn more, click here. On Saturday I went to a baby shower for my Nikki, my nephew's wife. They both absolutely loved my original dachshund quilt, "Dash Away, Dachs Away!" (They have two dachshund!) I love giving a quilt to people who appreciate it, don't you? The quilt features the Island Batik Vineyard collection which was also featured during my day on the Island Batik Back to School Blog Hop. See other quilts I've made with the collection and enter the blog hop giveaways by clicking here. I also finished a pattern for RJR but I can't show you it until the fabric collection is released. And man, it is gorgeous so you'll definitely want to get some of it! Meanwhile my shop sale is still going on until the end of the month. Use the code MerryQAL20 at checkout to get a 20% discount off all patterns. This week I want to feature someone new to our group--Cherie @ Cherie's Quilting Journey. Last week Cherie shared some of the blocks she's making for a new quilt. She's a new blogger and I think a new quilter too, and would love to hear your suggestions for her blog and her quilting journey. Please pay her a visit and welcome her to our group! Congratulations Cherie! Here's an “I Was Featured” button for your blog. Newer PostBee Inspired August Block and Giveaway Winner!